John Furtado, Jr. passed peacefully in his home on July 16, 2018. He was a well-known member of the Martinez community. John was born in Crockett, CA and attended local public schools. In 1943, he joined the Marine Corps and participated in the Saipan, Tinian and Iwo Jima campaigns. He was awarded the Bronze Star and two Purple Hearts. Upon returning home, Mr. Furtado worked various jobs at Shell Oil and retired after 37 years of service. His wife of 38 years, Mary Ellen, preceded him in death in 1987. 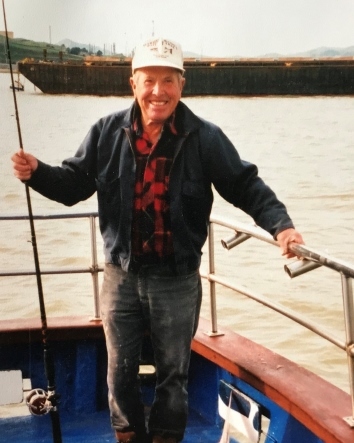 Mr. Furtado enjoyed fishing, gardening, and spending time at the Martinez Marina. Mr. Furtado is survived by his son, Michael Furtado of Martinez, daughter, Shirley Bohannan of Orange Park, FL, three granddaughters, two great-grandchildren, and good friend and companion, Debbie Heaney of Martinez. Family & friends are invited to a visitation on Thursday, August 16th from 4~8PM and a funeral service will be held on Friday, August 17th at 11AM both at Connolly & Taylor, 4000 Alhambra Ave, Martinez. Interment will be private. Gifts of flowers are welcome or donations can be made to Hospice East Bay.